Why are they so mind-blowingly beautiful? Is it the delicate petal, something between paper and flesh? Or the enormous resilience of seemingly delicate twists of blossoming ethers that can hold up their angel bodies in ferocious storms and come up smiling the next morning? 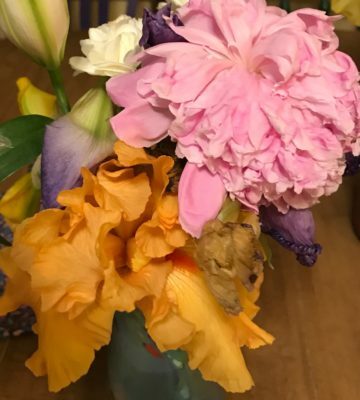 Is it the colors — batik blues and black-purples glistening in the rain, gold dissolving to peach to pink or yellow cusps of sun folded around a quiet center of intoxication? Also, the yellow ones smell like lemons, the purple ones like grapes, and the brown ones like chocolate. 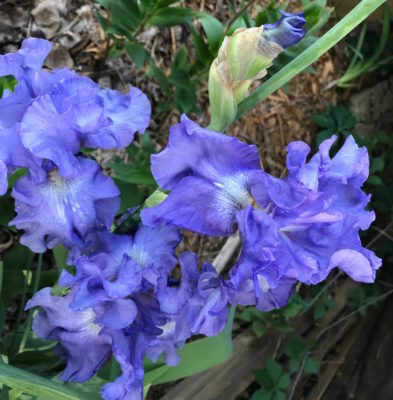 Whatever it is, irises had me at Hello Gorgeous! Let us not, however, ignore a blooming companion many years, the peony, a tight ball of pale pink that explodes into scent and major party animal blossom, but only after tiny ants irritate that bud first. 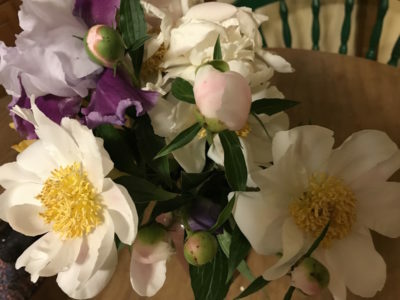 It’s true: peonies burst out at high speed mostly all at once, but the pain-in-the-neck order viagra or cialis online ants are a major player. Piss off a tight round bud, and voila! A peony that seems to stand on its stem outside or in a vase, belting out one show tune after another of big flower power. 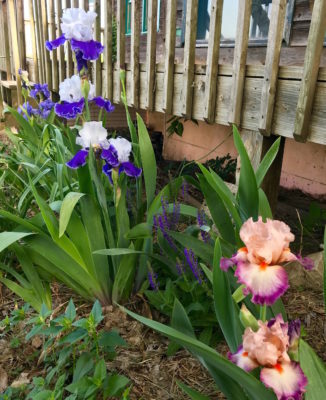 The iris are ever-coy and lower their eye lashes while flirting with the wind. The peonies lean back their big heads and start singing “Oh, What a Beautiful Morning!” Who could argue with either?